We have been getting up to 20/30 Goldfinch and same numbers of Greenfinch in the garden at the same time over the past month. Strangely though many have been ground feeding as even with 6 x 4 perch feeders in the garden there aren't enough spaces for all of them at once. We have been filling all 6 feeders daily but thankfully now its calmed down. Good to see so many Greenies as their numbers were dwindling with the dreadful Trichomonas disease. Not sure if these are all one family of Collared Doves. But regular visitors to garden. 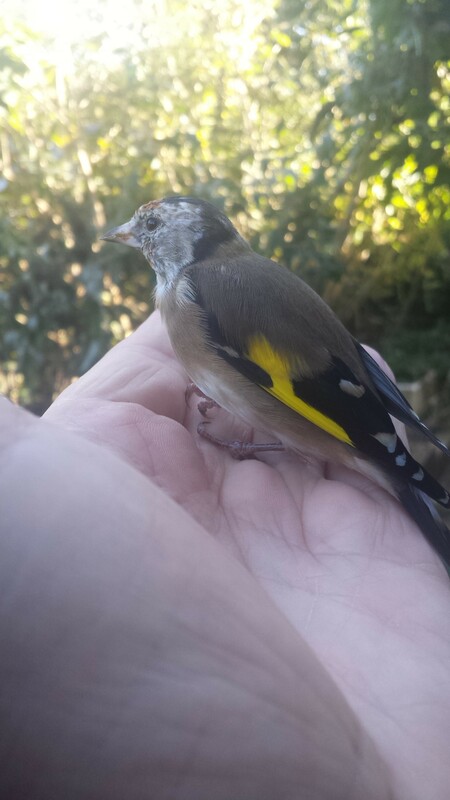 This little fella had a slight bump with the kitchen window, it wasn't knocked out just dazed and landed on a branch but noticed a wasp round it so went out to make sure it didn't get stung. Looks like a juvenile goldfinch, nicely saved from a possible wasp devouring it.